In another forum, they did what they called "DJ trading cards". Basically, they posted their photos on a template designed by one of the member DJ's. I thought they were pretty cool, so I picked up the template, which had been posted, and made a couple of the cards for myself and a couple of other guys on the forum. But of course, I wanted to have some fun with it, so mine were on the humerous side, which did NOT go over well with one of the moderators, even though the guys I did them for loved them. The moderator called them a "slap in the face" to the template designer, and threatened me with "taking action". Apparently they take their trading cards VERY SERIOUSLY on that forum. Taking DJ trading cards seriously is pretty funny to me in-and-of-itself! I was planning to combine my talent with the DJ trading card template and make some unique artwork for some of the members I communicate with frequently. I do caricatures and what I call portraitures (in pen and colored pencil), which are mostly portrait with just a little bit of exaggeration, and cartoon bodies. So now I've made a NEW template of my own design for this forum, and I did one of myself and one other DJ on this forum, just for the fun of it. They aren't exactly logos, but they could be printed and framed or printed on a T-shirt. Last edited by DJ Bobcat; 06-11-2016 at 12:10 PM. I didn't get any response to this thread back in 2016, but maybe I can stimulate some activity in this forum with my 2019 Trading Card. 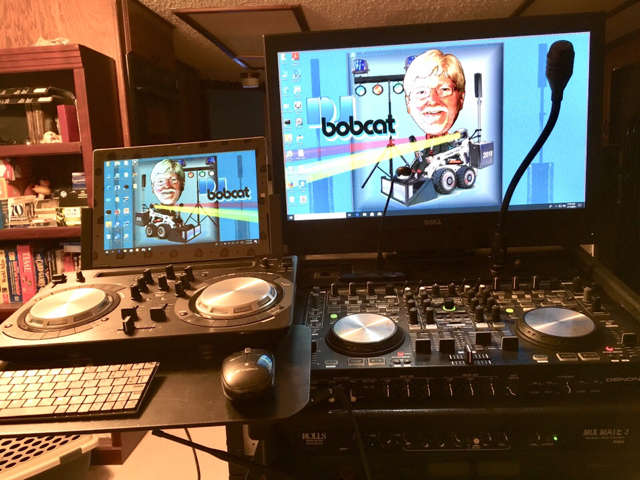 Last edited by DJ Bobcat; 03-11-2019 at 03:42 PM.